Power(s) given Fit through small opening, extend wheels over enemies. Car Yoshi, generically referred to as the Car or the Vehicle in Yoshi's Island-related materials, is a form Yoshis can assume in Super Mario World 2: Yoshi's Island and Yoshi's Island: Super Mario Advance 3 by touching a Morph Bubble containing its picture. Car Yoshi moves faster than a regular Yoshi and is smaller, enabling it to fit through small openings. Pressing will stretch its wheels for a short time, making it possible to avoid enemies or reach higher platforms. When repeatedly done near a wall, this also enables the player to "climb" up the wall. If hit by an enemy, Car Yoshi will be briefly unable to move. In Super Smash Bros. Brawl, Car Yoshi appears as a sticker. It can only be used on Yoshi in the Subspace Emissary to boost his tail attack power by 7 points. 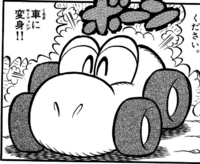 The Car Yoshi form appears in volume 14 of the Super Mario-Kun. It drives around, but Baby Mario, as Superstar Mario, notices it and gives it a redesign. 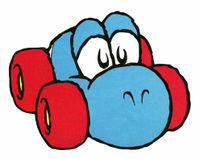 Despite the artwork of the Car being light blue, the Light Blue Yoshi never gets an opportunity to morph in a Car. Unused tiles depict the Car form with more heavily-shaded eyes than the final ones, which lack shading on the eyes entirely (except when the wheels are outstretched). ↑ Nintendo Power Volume 77, page 13. ↑ Yoshi's Island: Super Mario Advance 3 instruction booklet, page 27. ↑ Super Mario World 2: Yoshi's Island instruction booklet, page 19. This page was last edited on March 27, 2019, at 21:04.